Restoration Glass® is found in our country's most prestigious restorations, including The White House, Mount Vernon, and Monticello. From its aesthetics to its manufacture and tradition, Restoration Glass® closely reproduces the cylinder antique window glass of the 17th through early 20th centuries. It is the architect and designer's first choice for replacement of broken or missing antique window glass, as well as the detailing of reproduction homes and furniture. View through modern window glass. 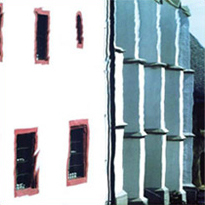 Full Restoration Glass® is more distorting and accurately replicates glass made in the 17th and 18th centuries. Its distinct appearance makes it an excellent choice for older colonial-style windows and cabinets, as well as antique and reproduction furniture. Light Restoration Glass® is less distorting and an excellent match for glass found in structures built in the 19th and early 20th centuries. 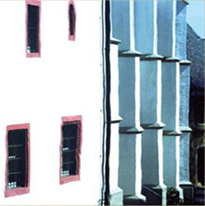 The slight distortion can be hard to distinguish in a small sample viewed up-close; however, it becomes more pronounced when viewed from a distance, in reflected light, and over a larger area. These characteristics make Light Restoration Glass® ideal for use in windows and doors. 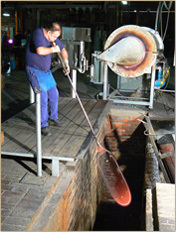 The historic accuracy of Restoration Glass® is due to the careful preservation and practice of authentic, antique mouth-blown glass-making processes by Lamberts' skilled craftsmen. Each sheet of Restoration Glass® is handmade utilizing centuries-old techniques and hand-selected at the factory to ensure the finest quality. The glass exhibits mild surface distortions, an occasional air bubble or pit, and other "imperfections" found only in original mouth-blown and antique window glass types. Restoration Glass' ease of handling, consistent thickness, and brilliant body make it a preferred alternative to salvaged antique window glass. Bendheim now offers Restoration Glass® in safety form, laminated to 1/8" (3 mm) window glass, to satisfy the most demanding building safety codes and sound control requirements. Laminated Restoration Glass® meets the requirements for ANSI Z97.1 and the Consumer Product Safety Commission Standard 16 CFR 1201. It is ideal for use in doors, sidelites, windows, and wherever safety is required. 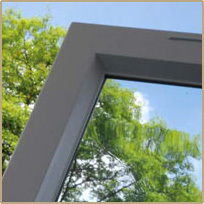 Restoration Glass® can also be incorporated into insulated door and window units (IGUs). Please discuss this option with your window manufacturer. 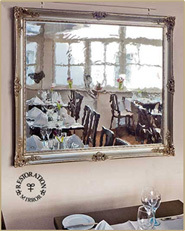 Restoration Mirror™ in a dining room. Restoration Mirror™ is a truly unique handmade mirror. The silvered Restoration Glass® creating this special home décor accent is mouth-blown by the skilled glass masters of Glashütte Lamberts in Germany. Its wavy appearance, occasional air bubble, and subtle surface imperfections create an old world charm. Installed in a contemporary or a well-loved antique frame, Restoration Mirror™ brings a romantic, luxurious element to traditional and contemporary décors alike. It can enhance interior lighting and feature as an unexpected art piece in hotels, restaurants, and homes. Restoration Glass® and Crown Bullion (Bullseye) Glass are brought to you through the decades long collaboration between Bendheim and Glasshutte Lamberts of Germany. 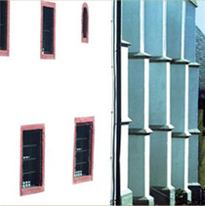 In 1979, Bendheim recognized the need for glass suitable for serious historic restoration and reproduction work. Bendheim chose our life-long partner, Lamberts, known internationally as the finest producer of traditional, blown sheet glass, to reproduce these glass varieties. The result: superior, authentic mouth-blown restoration window glass that no machine-made glass can compare to. Since then, Restoration Glass® has become an important part of some of America's most distinguished historic restorations, including the White House, Mount Vernon, and Monticello. When you purchase Bendheim Restoration Glass®, you receive the finest glass for historic restorations and reproductions in the world.